Hello! It's the last day of Vegan MoFo! What a whirlwind that always is. I salute all of you who started at the beginning and stuck through the whole thing. I only started halfway through! Shall we celebrate our blogging achievements with some cake? Yesterday I asked if you could guess my favorite treat. I said my taste buds are simpletons and that my favorite treat was 'stremely simple because I like simple flavors. Are you ready for the big, shocking reveal? My favorite sweet treat is... chocolate cake! 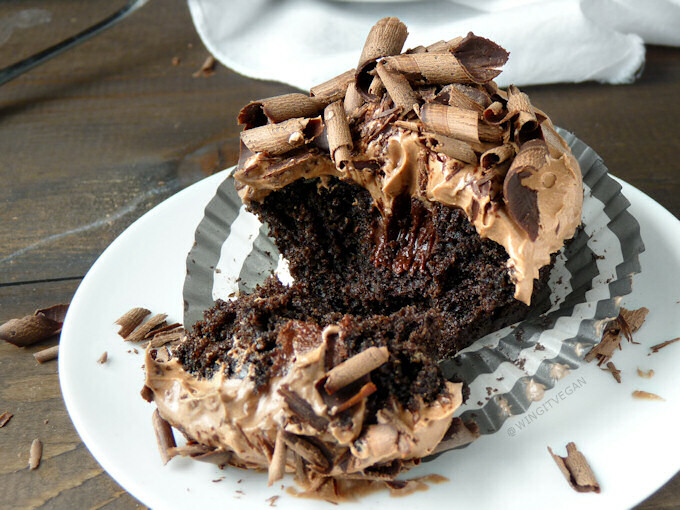 Always chocolate cake. Simply flavored. No adventurous variations. No coffee or goji berries or rum or chili powder or roasted garlic, thankyouverymuch. Just the chocolate. ALL the chocolate. When given a choice, I'll always go with chocolate! 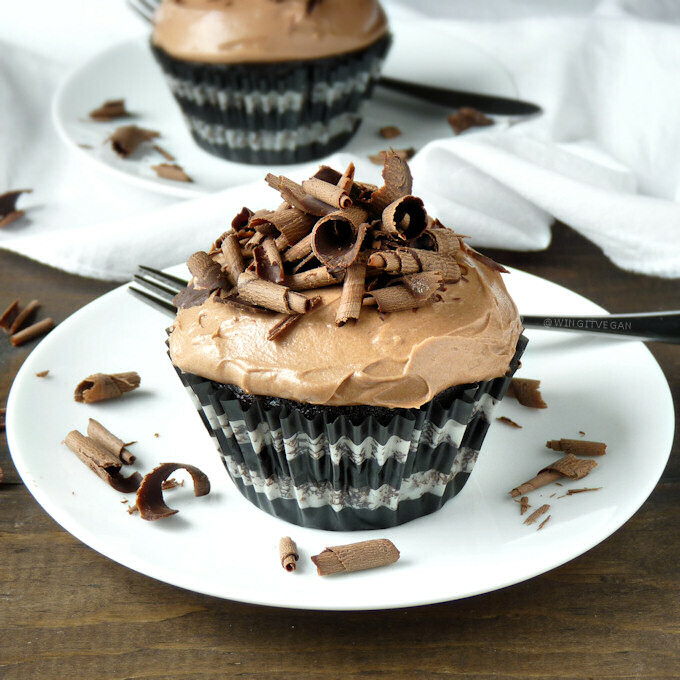 These are little chocolate cakes filled with silky chocolate ganache, then smothered with creamy chocolate buttercream and topped with semi-sweet chocolate curls or shavings. ALL the chocolate! 1. These baking directions are for the Cuisinart TOB-60. You'll probably need to experiment with your toaster oven settings to get the best results. More on that here: How to Bake Perfect Cupcakes in a Toaster Oven. Preheat the toaster oven to 325 degrees F (160 degrees C) and spray two cupcake liners with cooking spray. Place the liners in a small muffin tin. For the Cuisinart TOB-60, preheat the oven on the WARM function so that only the bottom heating elements are activated. 2. In a small bowl or coffee cup combine the sugar, oil, and milk and whisk vigorously for at least 30 seconds. 3. Sift in the flour and cocoa powder and add the salt, baking soda, and baking powder. 4. Fold everything slightly until you end up with a somewhat lumpy batter. Take care not to over mix the batter at this point! No more vigorous whisking or beating. 5. Add the rest of the milk and vinegar and fold gently again until everything is incorporated. Try not to over mix the batter. 6. Pour the batter into the prepared muffin tin and bake on the WARM setting for 12 minutes, then switch to the BAKE setting and bake for an extra eight minutes at 325 degrees F (160 degrees C.) If you're using a different toaster oven you may be able to use the BAKE setting from the start. 9. Remove the cupcakes from the oven and let them cool in the muffin tin for a few minutes before transferring them to a cooling rack. Let them cool down completely at room temperature. 10. When the cupcakes have cooled down to room temperature use an apple corer to remove a bit of cake from the center of each one. If you don't have an apple corer, you can try using a pointy, serrated knife to cut off a little cone-shaped piece from the center of each cake instead. It doesn't have to be a very big hole, only about half an inch wide and deep. 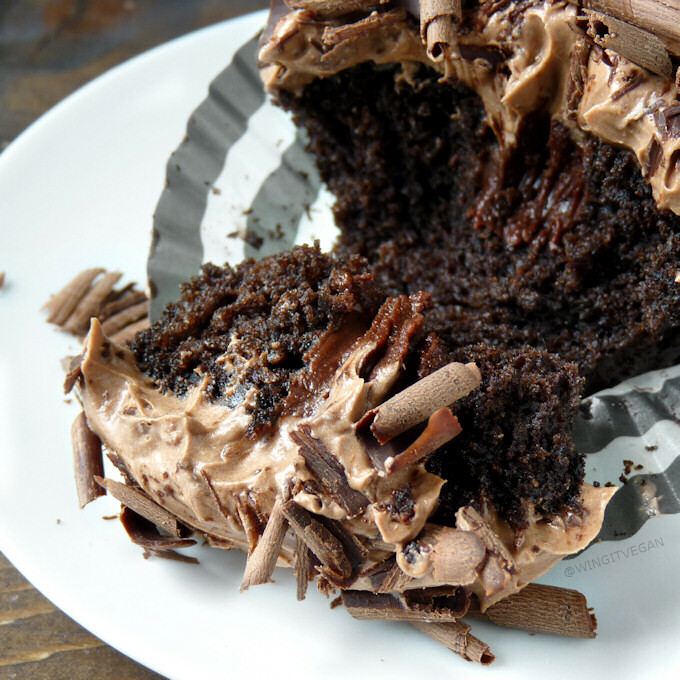 You can discard the bits of cupcake that you remove. And by discard I mean... eat 'em! 1. Combine the chocolate chips and milk in a small microwave-safe bowl. I like to use a glass bowl or cup so I can keep an eye on it and make sure it doesn't bubble up in the microwave. 2. Microwave on high for 15 seconds. Stir. Microwave again if necessary for 10 more seconds. Stir. Repeat if necessary until the ganache is smooth and silky and let it cool down to room temperature. 3. 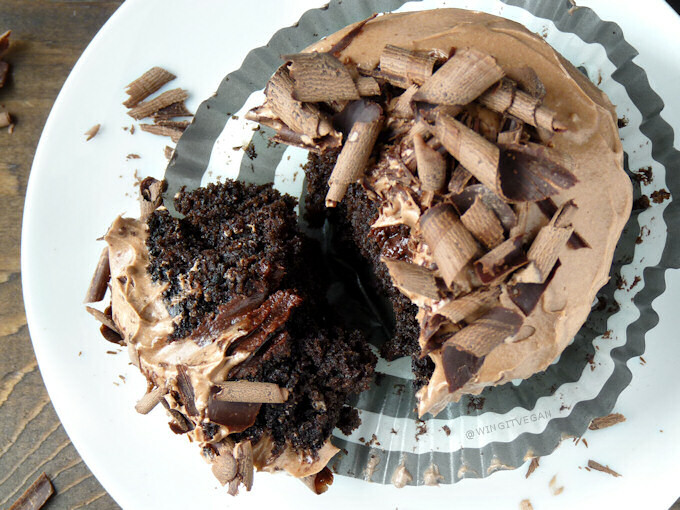 When it has cooled down to room temperature, use a small spoon to fill each cupcake hole with the ganache. 1. Weigh the shortening into a small, narrow bowl or cup and beat it for about a minute or until it looks smooth. 2. Add the sifted powdered sugar and cocoa powder and beat until smooth and fluffy, about 30 seconds or so. 3. Give it a taste and add more powdered sugar if needed. Depending on how much powdered sugar you add, you may need to add a tiny bit of milk if the frosting is not getting soft and fluffy. 4. Add in a tiny pinch of salt, only a few grains, and give it a good stir. 5. Now that the cupcakes are at room temperature and filled with the ganache you're ready to frost them. Plonk the frosting on top of the cupcakes and use a little spatula, or a non-serrated knife, or the back of a small spoon to smooth out the buttercream frosting. 6. Now for the topping. You can use a cheese grater to simply add some chocolate shavings to the top of the cake, or if you want to make curls like I did, you can use a potato peeler to "peel" the sides of a semi-sweet chocolate bar. Just like you would a potato. It helps if you warm the chocolate in your hand for a few seconds to get it nice and warm and pliable. I like to use food-handling gloves for this because once that pesky chocolate gets under your nails and melts it will remain there for all eternity.
. Feel free to use proper cake decorating tools and pipe the icing on with a pretty decorating tip. I can't be bothered to go through all that trouble for only two cupcakes!
. I use +Spectrum Organics shortening which is Colombian palm oil. If you can't find a shortening you're comfortable using, you can always replace it with coconut whipped cream, You may need to adjust the amount of sugar because coconut milk is kind of, sort of sweetish? 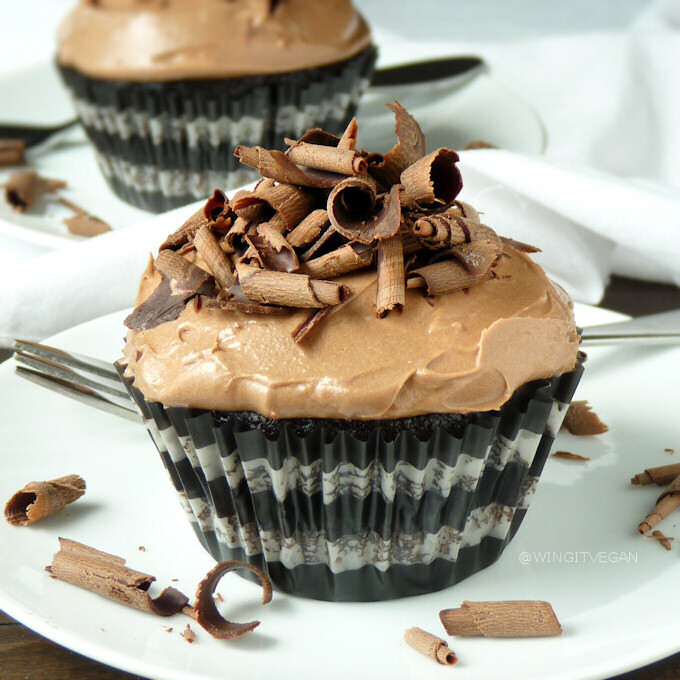 Keep the cupcakes refrigerated if you're not going to eat them right away!
. Check out my blog post about baking cupcakes in a toaster oven.
. All the ingredients are weighed, even the liquids, and I'm using the metric system. Grams are more convenient than ounces or cups when it comes to baking tiny batches of things. I use an Escali Digital Scale which has a handy "tare" button that lets me reset the weight after I add each ingredient.Screw you, unreliable cups and tablespoons! Except for baking soda and salt and all those tiny pinches of things. For those I use my tiny 1/8 tsp from my set of +Wilton measuring spoons. How do you measure 1/16 tsp of salt and baking soda? I eyeball it using half of an 1/8 tsp.
. I bake everything in a Cuisinart TOB-60 toaster oven. You may need to experiment with your toaster oven to get the best result.
. I had a hard time finding a small cupcake pan that would fit my small toaster oven. Luckily I found a +Wilton six-cavity muffin pan that has been excellent, except for the fact that some pink Wilton cupcake liners stained it! Overkill! I'm not even sorry though. I don't make these very often because the whole thing is a bit of a production and a sugar fest. 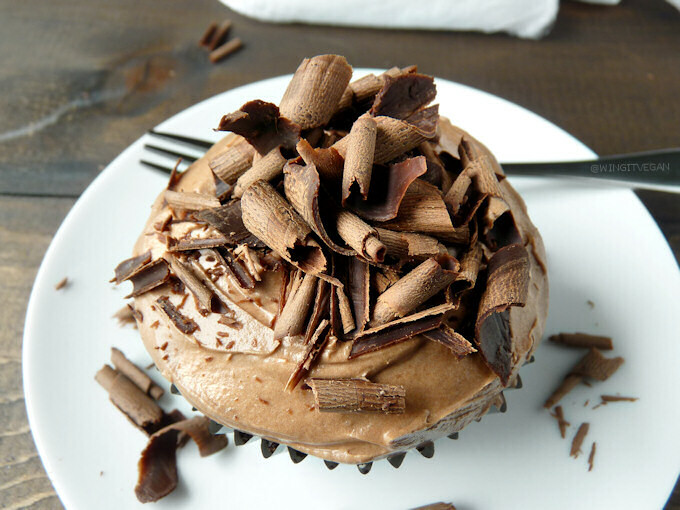 Usually, I'll just make these simple chocolate chip cupcakes instead and call it a day. But these are such a lovely treat! Do you celebrate Halloween? Are you going to any Halloween parties today? What's your costume going to be? I'm going as a ghost. Not one of those ghost costumes where you just throw a white bed sheet over your head and cut out a couple of eye holes, but an actual invisible ghost. I'll be there, you just won't be able to see me because my costume will be THAT excellent. I certainly won't stay at home in my pajamas watching Harry Potter movies and eating junky snacks instead. Nope. Ghost. + Links with a plus sign are affiliate links. If you purchase something through one of my affiliate links I'll get a commission. Cha-ching! I'm only sharing these because they are Mr. Wing-It's favorite chocolate chip cookies. They are loaded with chunky chocolate and hazelnuts and they have a slight chewiness going on. I think they're OK, but I'm more of a puffy chocolate chip cookie kind of person. 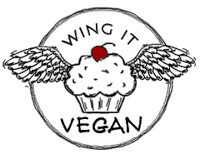 Mr. Wing-It loses his composure and makes nomnomnom noises when he eats these. I could take them or leave them and I'll usually eat one and let Mr. Wing-It have the other three. They're only little cookies! 2. In a small bowl combine the 5 grams of flour, white sugar, brown sugar, oil, milk, and vanilla extract and use a mini whisk to whisk until smooth. Let that mixture rest for five minutes and whisk it again until it becomes creamy and almost like a caramel. It will take about 30 seconds of vigorous whisking. 3. Add the rest of the flour, salt, baking powder, chocolate chips, and hazelnuts and use a spoon to stir until just combined. Try to only stir it until all the ingredients are incorporated. Too much stirring will make these cookies too tough and chewy. The dough should be firm but not dry and crumbly. If it's too dry you can add a tiny bit more water. And if the dough is too soft and sticky you can add a bit more flour, always trying not to overwork the dough. 4. Divide the dough into six parts and then roll each piece between your hands to shape each piece into a ball. Place each ball of cookie dough onto the parchment paper and flatten the tops only slightly. 5. Bake for six minutes, then rotate the cookie sheet and bake for four or five more minutes or until the cookies look golden brown. The Cuisinart TOB-60 doesn't get these toasty on top, so you'll need to change the oven setting to BROIL (still at 350, no higher!) for the last three or four minutes. You may need to experiment if you have a different oven, but always watch it closely or the parchment paper might burn! 6. Transfer the cookies to a cooling rack and let them cool down a bit before digging in! IMPORTANT: I bake these in my toaster oven. Most parchment papers come with a warning that says something like "not for use in toaster ovens", because parchment paper is flammable and the heating elements inside toaster ovens could potentially start a fire. The instruction manual/recipe booklet that came with my toaster oven calls for the use of parchment paper in some of the recipes, therefore I have assumed that it's safe to use parchment paper in my toaster oven, but you should do your own research and decide for yourself if you think it will be safe for you to use parchment paper in your little oven. If you can't find the info in your manual, contact the manufacturer and ask them if it is safe to use parchment paper in your toaster oven!
. All the ingredients are weighed, even the liquids, and I'm using the metric system. Grams are more convenient than ounces or cups when it comes to baking tiny batches of things. I use an Escali Digital Scale which has a handy "tare" button that lets me reset the weight after I add each ingredient.Screw you, unreliable cups and tablespoons! Except for baking soda and salt and all those tiny pinches of things. For those I use my tiny 1/8 tsp from my set of +Wilton measuring spoons. Only one more day of Vegan MoFo left! Tomorrow I will share my favorite treat. It will be 'stremely simple because I have simpleton taste buds who like very simple flavors. Can you guess what it's going to be? 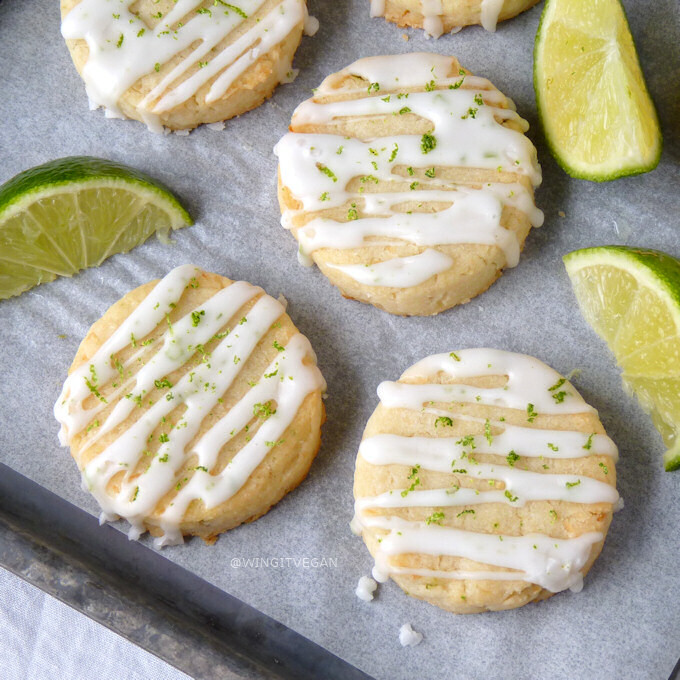 These are crispy and crumbly, similar to shortbread, with coconut and lime zest in the cookies and a zesty lime drizzle on top. This recipe yields six cookies. Why six cookies if it's meant to be for two people? Because they are tiny! 2. In a small bowl combine the 10 grams of flour, 20 grams of powdered sugar, oil, water, and lime zest and use a mini whisk to whisk until smooth. Let that mixture rest for five minutes and whisk it again until it becomes creamy and almost like a pale caramel. It will take about 30 seconds of vigorous whisking. 3. Add the flour, coconut, and salt and use a spoon to stir until just combined. Try to only stir it until all the ingredients are incorporated. Too much stirring will make these cookies tough and chewy. The dough should be firm but not dry and crumbly. If it's too dry you can add a tiny bit more water. And if the dough is too sticky you can add a bit more flour, always trying not to overwork the dough. The consistency should be similar to the cookies in the video below, only a bit lumpier because of the coconut. You can skip to the 1:47 mark to check out what the dough looks like. 4. Use a small 1 3/4 inch cookie cutter to shape the cookies directly onto the parchment paper. Check out the video below at the 1:47 mark to see how I do that using a small spoon and my little cookie cutter. If you don't have a small cookie cutter, you can divide the dough into six pieces and then shape each piece into a ball. Place each ball of cookie dough onto the parchment paper and flatten them slightly until they're a bit less than 1/3 inch tall. 5. Bake for 10 minutes, then rotate the cookie sheet and bake for 10 more minutes. If you want your cookies to look golden brown on top you may need to change the oven setting to BROIL and crank up the heat to 350 for the last two minutes. But watch it closely or the parchment paper might burn! 6. Transfer the cookies to a cooling rack and let them cool down to room temperature before you continue. 7. In a small bowl or cup combine the 45 grams of powdered sugar, lime juice, and 1/4 teaspoon of lime zest and stir until smooth. The icing should be thick and creamy. If it's too watery just add a bit more sifted powdered sugar, and if it's too hard and it doesn't flow easily just squeeze a bit more lime juice in there. 8. 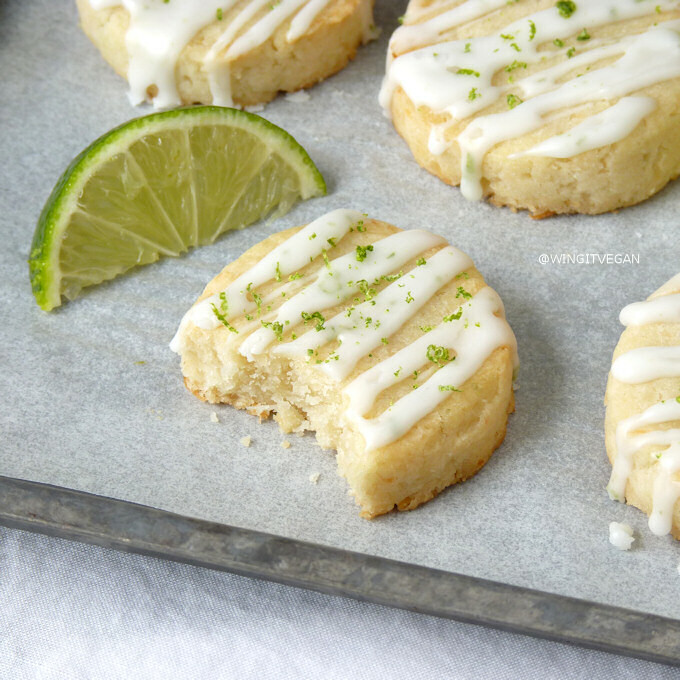 Drizzle the icing all over the cookies and sprinkle a bit more lime zest on top while the icing is still wet if you want to give them a little pop of color. Let the icing dry for a few minutes at room temperature and enjoy! This video is for the Chocolate-Covered Shortbread Cookies I shared the other day, but the method of pressing the cookie dough into the cookie cutter is the same. Skip to 1:47 if you'd like to see what that looks like. Last Thursday I shared a recipe that makes me feel happy things. Today I'm doing the same! These almond paste scones are such a treat! Well, it's the almond paste bits inside the scones that I consider a treat because almond paste is expensive. I always hoard boxes of it whenever I find it on sale somewhere because I can't bring myself to pay full price for it. I think the regular price at our grocery store is over seven bucks. Ouch! But the nice thing about baking tiny batches of things is that one box of almond paste can last quite a while. The almond paste that I use is by Odense. They also make marzipan but it has more sugar and fewer almonds than the almond paste. These are crusty on the outside and soft and crumbly on the inside with random bits of gooey almond paste all over. 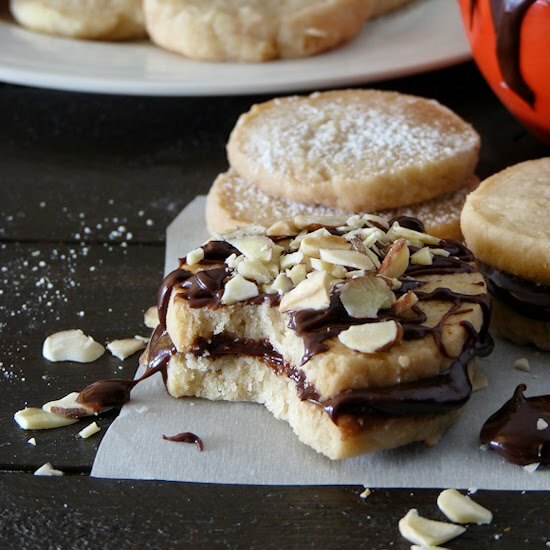 They are also flavored with almond extract and they have a few almond slices on top. Honestly, I don't usually bother with the almond slices but because these look pretty generic and unimpressive without them I thought I'd throw some on there for the photos. I could take them or leave them! 2. Cut the almond paste into about 1/3 inch squares and set aside. I always keep my almond paste frozen so cutting it is easier and less sticky. 3. In a medium sized bowl combine the flour and coconut oil and use a dough blender or a large fork to mash the oil into the flour until the mixture resembles coarse cornmeal. This will take a minute or two. 4. Add the sugar, salt, and baking powder and mix well. 5. Throw in the almond paste bits and toss them in the flour mixture to coat them well. 6. Add the coconut milk, vanilla, and almond extract and use a large spoon to stir quickly until just combined. It should only take about nine or ten strokes with the spoon. 7. Turn the dough onto a lightly floured surface (I use a bamboo chopping board as my work surface) and shape into a circle about four inches wide and 3/4 inch high. Try not to handle the dough too much, just plop it on the surface, pat it down a bit to flatten the top and use your palms to shape the blob of dough into a circle. 8. Brush a bit of coconut milk all over the top of the dough and sprinkle a little sugar all over it. About a teaspoon of sugar will do. If you're doing the almond slices, pop them on top of the sugar and very gently press them down into the dough. 9. Use a large knife to cut the circle of dough into four triangles and transfer each one onto the prepared baking sheet. 10. Bake for 12 minutes, then switch to BROIL and bake (still at 315 degrees) for an extra three or four minutes. Your oven may be different than mine. Keep a close eye on the scones especially during the broiling time because the parchment paper may burn! If your oven is well behaved and things often get browned on the top without having to broil them, you can just bake these at 375 for 15 or 16 minutes. Mine needs a little help and I need to broil them to brown them. IMPORTANT: I bake these in my toaster oven. Most parchment papers come with a warning that says something like "not for use in toaster ovens", because parchment paper is flammable and the heating elements inside toaster ovens could potentially start a fire. The instruction manual/recipe booklet that came with my toaster oven calls for the use of parchment paper in some of the recipes, therefore I have assumed that it's safe to use parchment paper in my toaster oven, but you should do your own research and decide for yourself if you think it will be safe for you to use parchment paper in your little oven. If you can't find the info in your manual, contact the manufacturer and ask them if it is safe to use parchment paper in your toaster oven! And keep an eye on it in case it starts to burn even if the manual says it's OK to use parchment paper! Do you see the pieces of almond paste? Maybe not. They are almost the same color as the crumb! They are like invisible little bites of joy, but they are there and they are delicious. I really hope you love these as much as I do if you get a chance to make them! P.S: Susan, my deepest, most sincere apologies!